Behind the fashion show curtain and red heart displays of the annual Southern Delaware Go Red For Women Luncheon, you’ll find a group of empowered women polishing scripts and managing last-minute details. 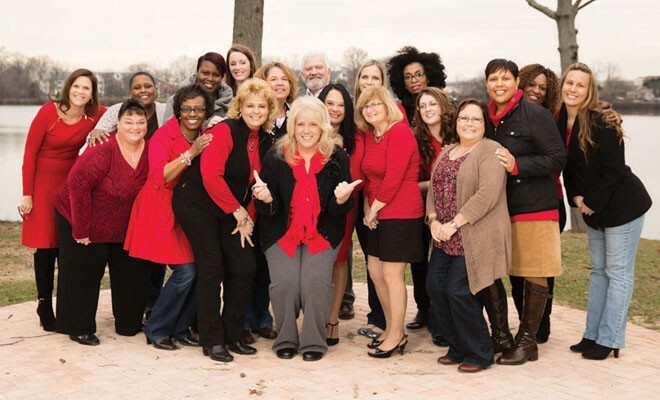 Before the curtain is ever drawn, a committee of women chaired by Elaine Bittner, Chesapeake Utilities Corporation, will have spent countless hours to help raise awareness of heart disease in women – and how to prevent, treat, and live with its effects. It’s the combined power of these women – and the hearts that power them – that lead to an inspiring, educational and meaningful event. Here are their stories, the Power of a Woman’s Heart. In her second year as Event Chair for the Southern Delaware Go Red For Women Luncheon, Elaine Bittner has motivated many. 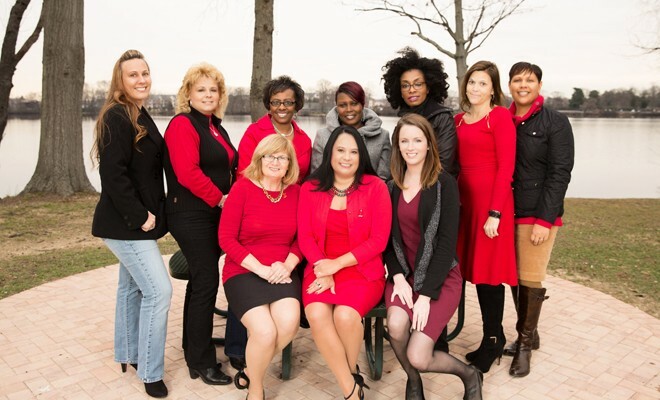 This year’s event planning committee is comprised of many caring and dedicated women working together to promote awareness of heart disease and stroke in women. Heart disease and stroke have affected many members of Elaine’s family. A significant influencer of Elaine’s heartfelt commitment to the Go Red For Women campaign is her dear grandmother, whom Elaine lost to heart disease. Elaine was one of her grandmother’s caretakers while she battled with this disease. Working in healthcare and being an advocate for women’s health are not Cassandra Humphrey’s only motivators for being part of the Go Red For Women Committee. Cassandra’s inspiration is credited mostly to her love for her grandmother. Cassandra’s grandmother suffered two heart attacks with her battle of cardiovascular disease. Additionally, Cassandra experiences the same issues which her grandmother had with her heart health – shortness of breath and difficulty walking upstairs. 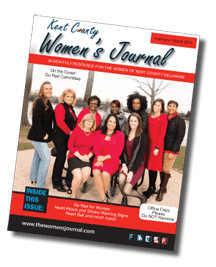 “The Southern Delaware Go Red For Women Luncheon is an annual event that is near and dear to my heart as my maternal grandmother, Lovie King Hart, suffered a stroke in 1990,” said Debbie Smith. After her stroke, Debbie’s grandmother at age 75 had a triple bypass procedure which increased her life span to the age of 95. As a result of her grandmother’s stroke, Debbie has been faithfully contributing to the American Heart Association. Also as a member of the Go Red for Women Committee, Debbie is dedicated to empowering women to take care of their minds, bodies and souls. When Heidi Watkins was a sophomore in high school, her father suffered a massive heart attack that only a small percentage of people survive. “My dad lived for 16 years after that heart attack – long enough to walk me down the aisle and enjoy the birth of my son,” said Heidi. Unfortunately, on Thanksgiving Day in 2000, Heidi’s father passed away as a result of heart disease. “When I was little I was always a ‘daddy’s girl.’ I was the youngest of three, with two much older brothers, so I admit I was a little spoiled,” said Heidi. “My dad and I had a special bond because he had wanted a little girl for many years. We shared a love of family time and animals, and enjoyed going to craft shows together. My contribution to Go Red for Women and the American Heart Association gives me a feeling of fulfillment that I am helping others, women and men, to live healthier and longer and to enjoy the important things in life – their families. “My grandmother never really knew that she had any issues – until she had her first heart attack at age 61,” said Lisa. At that time, Lisa’s grandmother was then diagnosed with coronary artery disease and aortic stenosis. From then on, she saw her cardiologist regularly and remained on blood pressure medication. Additionally, Lisa’s grandmother suffered from angina due to blocked arteries and would occasionally have to take nitro glycerin. However, she refused any type of surgery and just managed her condition with medication until age 86 when she had a fatal massive heart attack. Eight years later, while at a company health fair, Lisa had her blood pressure checked for fun. To her surprise it was extremely high. Like her grandmother, Lisa only went to the doctor when she was sick and didn’t have a physical in years. Lisa now has regular checkups with her cardiologist and takes medication for her high blood pressure. Lisa was also diagnosed with a heart murmur and atrial septal aneurysm. Lisa never knew that she had both of these conditions though they are minor issues which can be monitored. Lisa’s blood pressure is now under control and she is committed to keeping her heart healthy. Melissa Stamper’s heritage is that of strong women who have been stricken with stroke and heart disease, which is the spirit of her compassion for the Go Red For Women Committee. “My family’s medical history has caused me to educate myself and other women on the signs, symptoms and the importance of regular doctor visits,” said Melissa. “My maternal grandmother passed away at the age of 83 from congestive heart failure. As a note, she was also legally blind. After the stroke, Melissa’s aunt suffered a heart attack and passed away at the age of 53. Melissa’s mother had a cough that doctors at the time tried to treat with steroids and other medicines for approximately six to eight months. After Melissa’s mom repeatedly commented that something was not quite right, a doctor confirmed that her arteries were clogged. In 2010, Melissa’s mother had surgery for a stent implementation. Following, Melissa’s mother was required to take medicine daily to avoid the arteries from clogging again and for the stent to function without any issues. In 2012, Melissa’s mom had a second surgery to reopen the arteries and insert another stent. Marie Kozel’s inspiration for being part of the Go Red For Women Committee is her parents. Marie and her family have supported the American Heart Association since losing her father, John Kozel, Jr., to cardiac arrest. “My father, who suffered his first heart attack in the fall of 1988, had open heart surgery in March 2006 and passed away later that same year from cardiac arrest,” said Marie. Additionally, Marie’s brother suffered a heart attack at the age of 49 and today, thanks to the advancements in prevention and treatment of cardiovascular disease, he is living a healthy life. While reading to her granddaughter’s first grade class, Marie’s mother, age 77, found it difficult to read and even struggled speaking. Suspecting that she may be having a stroke, Marie’s mother was able to get to the emergency room where her suspicions were confirmed. She suffered a stroke. With her determination and resilience, Marie’s mother overcame the effects of the stroke. “Time is critical in identifying and treating heart attacks and strokes for everyone,” said Marie. Our cover photo is of the Go Red Committee. It was taken at Chesapeake Utilities facility. Thank you to Chesapeake Utilites for allowing us to take our cover photo shoot there. Thank you to the committee members of Go Red that participated in our day. And thank you to Escudero Photography for the wonderful pictures for our cover and profiles pages. A fun time with some wonderful ladies!